When it comes to home improvements, we all want modern and secure doors in our home. We also want doors that functional, attractive and enhance our living spaces. Bi-fold Doors, Sliding Doors or French Doors will all give you these features. But which is the best type of door for your home? 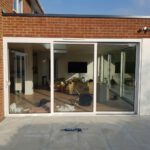 In this article, we give you our advice, some pros and cons and general information if you are trying to choose between Bi-fold Doors, Sliding Doors or French Doors. Choosing between Bifold Doors, Sliding Doors or French Doors. 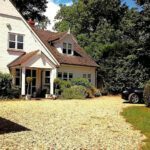 It is quite likely your new doors will go at the back of the house to make the most of your outside space, to give access in and out and of course, to make your home better all round as part of your home improvement project. This is where you will find bifolding, sliding and French doors more likely to be fitted. It is good to get the technical merits of these three doors covered first. With modern double glazing, whether PVCu aluminium or timber, Building Regulations, British Standards, CE Marking and so forth mean there are no ‘substandard’ products on the market. You will find most good quality doors feature aluminium, glass, colour finishing, gaskets, hardware and fixings that are produced to strict standards. These components all come together to create a secure and reliable door for your home. Therefore, with any door from Aspire Bifolds, you can expect superb levels of home security. You will also get quality glass units that work with the insulated frames to create a more energy efficient door. Finally, you will get sophisticated seals, rubbers, gaskets and frames that all work together to keep your doors weather resistant and sealed tight when needed. So now we can discuss the individual merits of Bi-fold Doors, Sliding Doors or French Doors and which of these doors is best for your home. Where will you be fitting your new doors? There are three areas where is it likely you need new Bi-fold Doors, Sliding Doors or French Doors. To replace your existing doors. As part of a new build home or new extension. To enlarge an existing window or door opening. Doors to replace your existing doors. If you have old doors that you wish to replace, this is the easier installation to carry out. We measure your existing opening and work with you to design the best type of door. Smaller openings will naturally call for a set of French doors. A larger opening can suit a sliding door or a bifolding door. Sliding doors are available from two panels up to six. A smaller patio can have one or both leaves sliding. The bigger you go with sliding doors, the more choice of tracks you can get meaning you can have multiple panels on more than one track that are able to slide in one or more directions. on the bigger door sets. For bifolding doors, two up to seven panels are available. Old French Doors can be replaced with a two panel bifolding door, larger openings can start to enjoy three panel doors. on the bigger door sets. Doors in a newly built extension. The great thing about building a new extension is you can choose just how big you want your doors. Your builder can create a structural opening for either bifolding or sliding doors. 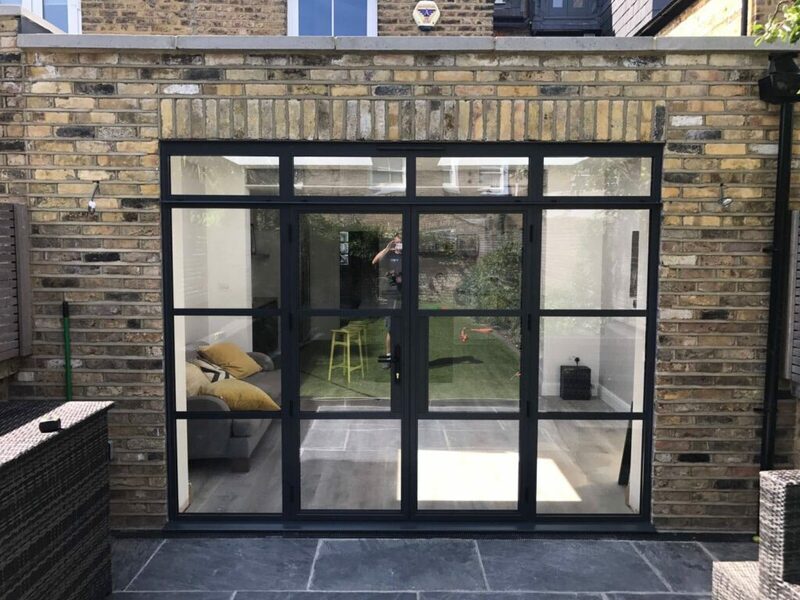 There is also no reason why you can’t choose an aluminium door with big side panels as our main image shows with our latest aluminium system that replicates old steel doors. Therefore your structural opening will dictate the door you can have. Enlarging an existing opening for a new door. One way to add a great new door to your home without the cost of major building work is to take an existing window opening and enlarge it for a door. Most experienced and professional window companies can do this work for you, for example, knocking out the structure below an existing wide window and creating a lovely new door opening. In this situation, you are again flexible in having Bi-fold Doors, Sliding Doors or French Doors. A smaller opening is ideal for French Doors. Smaller openings are ideal French Doors. Bigger openings give you the choice of bifolding doors or sliding doors. Consider enlarging an existing window and fitting a new set of aluminium doors. How much space will Bi-fold Doors, Sliding Doors or French Doors take up? Here is where these three types of doors differ. Sliding doors are the best for space-saving because they work within their existing framework, have no hinges and to not encroach on a room or your outside space. French doors can hinge either in or out and in the open position will take up some space, depending on how wide the doors are. Bifolding doors work on the same principle as French doors but can take up even more space when you consider all those door panels folded upon one or more sides. With some of our doors going up to 1200mm in width, how much space a fully open bifold door set is worth considering. We can help you decide. Therefore for space saving, consider whether your doors will take up space in your home or out in your garden. If you have a small patio area, sliding doors may be best. Visit our showroom and see all these doors in action and we can help you decide. 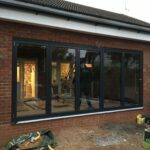 Pros and Cons of bifolding, sliding and French Doors. Cost, your property style and the size of your structural opening are three factors that will also determine what style of door is best for your home. 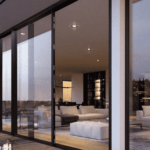 Let us explain what advantages and disadvantages there are with Bi-fold Doors, Sliding Doors or French Doors. The great thing about a new French Door is its low cost compared to sliding or bifolding doors. When made of aluminium French doors also give you other benefits. Aluminium doors can now be manufactured at up to 2400mm wide and 2400mm high with most quality brands meaning you don’t need additional and more costly side panels, like you get with PVCu. The sight lines of aluminium are much thinner so you can get the most out of the door glass. It is hard to find French Doors that exactly match other doors in the home. If you are building a new extension with folding doors and French doors, our Origin range of products uses the same door profile in folding and hinged doors. Your doors can look the same if you wish. Low cost compared to sliding or folding doors. Available with a choice of midrails, glazing bars, integral blinds and panels with cat/dog flaps. Not as desirable as sliding or bifolding doors. Stay projected outwards when open. In windy locations, you may need to consider a restrictor device. Central mullions thicker than sliding or folding doors. Choosing new Aluminium Sliding Doors. Apart from the space-saving properties of new aluminium sliding doors, they have one huge advantage over bifodling doors and French Doors. That is, the biggest available glass sizes. Even with a standard sized aluminium patio door you can enjoy wide glass panels than a hinged door. Our advice is simple. If you want to maximise the views from your room all year round, or if you have a large garden, great country views or other outside feature, think about having sliding doors. When compared to bifolding doors or French doors, aluminium sliding doors have two significant advantages. The first is that no other door gives you the glass sizes of sliding patio doors. With door panels available up to 9 square metres with most quality systems, if you want the biggest glass walls and the maximum amount of light, sliding doors are perfect. Sliding doors are now slimmer than ever. Our new Origin sliding door has a central mullion of just 20mm, making it one of the thinnest sliding doors you can buy. With a near frameless appearance, this sliding door can transform the views and your room. Visit our showroom and take a look at this door today. It is stunning. When compared to bifolding doors or French doors, aluminium sliding doors have two significant advantages. The first is that no other door gives you the glass sizes of sliding patio doors. With door panels available up to 9 square metres with most quality systems, if you want the biggest glass walls and the maximum amount of light, sliding doors are perfect. Sliding doors when designed as part of a new extension can even slide into the walls disappearing from view. Modern sliding doors are vastly different from old patio doors you may be familiar with. Take up the least amount of space when open. Now one of the slimmest doors on the market. Advanced rollers and technology make even big heavy doors effortless to slide. You will get the best view from a sliding door, thanks to the large glass panels. Doesn’t offer the convenience of quickly opening a door like a French Door. More expensive than French Doors. You can sink a threshold but won’t normally achieve a fully flush threshold. The size of the doors and the glass can mean handling considerations. A bifolding door is very desirable and can add real style and value to your home. Bifolding doors are beautiful, versatile, functional and come into their own in the summer. Our advice is to choose a bifolding door if you love using your garden and want to make the most of it. 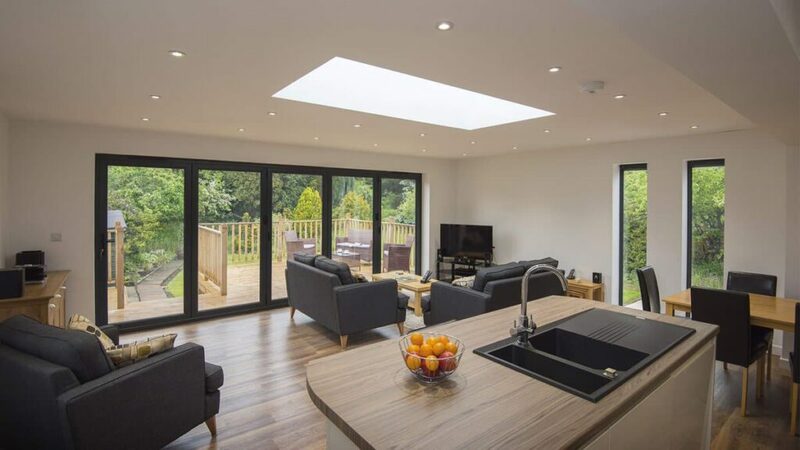 A bifolding door will open up your home with a barrier free route out to your garden or patio. Bifolding doors can also be configured to make them just as convenient as a French door with a traffic door. Traffic doors let you get in and out of your doors without having to fold the panels back every time. Can work in a small or large opening. Highly desirable in the home. Useable all the time thanks to traffic doors. Will not give you the expansive views of a sliding door when closed. Multiple panels and where they stack needs to be considered. More expensive than French doors and some sliding doors. Need more help to choose between Bi-fold Doors, Sliding Doors or French Doors? Contact us. Our brand new showroom showcases some of the finest sliding, folding and French doors you can buy. We offer no less than five different bifolds on display as well as a host of other home improvment product. The best way to experience a quality door is to see it try it. Visit our showroom and take a look at how Aspire Bifolds can improve your home.